13 years ago, I found myself taking part in a week-long immersion in Calawis, Antipolo – a social initiative that was organized by my college org (UPSCA). It was in that immersion that I was able to experience how it was to live in a barrio, and how to live together with a family other than my own. My “barriowork”, which focused on the rural poor, was an eye opener. Living without my usual comforts was challenging yet humbling at the same time. And remembering all of these memories brought me back to why I fell in love with Calawis. I was so happy to be back, and this time, to meet another gracious host: The Malvar Family. Mount Purro Nature Reserve is more than just an ecotourism destination with fully-equipped facilities and eco-friendly accommodations. They are the future. The family-run Mount Purro Nature Reserve isn’t found atop Mount Purro; but is located in the foothills of the Sierra Madre Mountain Range in Barangay Calawis, Antipolo City. The 36-hectare forest sanctuary, which serves as a base camp, got its name after the highland because the owner chose a remote town in the area of Mount Purro to do his reforestation work in the 90’s. And it is through his efforts to plant more trees earlier in the day that a lot of people are now reaping the fruits of his actions. Since then, 1,000+ trees have already been planted. The head of the family, Mr. Toto Malvar, initially used the area as their personal space, until they decided to turn it into a nature camp – a place where “families, friends and organizations can visit to come face-to-face with nature and the great outdoors.” MPNR was also established so that they could build a social initiative by simply providing livelihood for the community, and by educating more people about the environment. They continue to offer our fellow Filipinos a venue to enjoy nature and to also enjoy each other’s company, in hopes that their advocacy will spread to many more individuals. MPNR’s mission is to take care of the environment, the forest, and the upland community. And so far, they’re doing a great job. "In order to take care of the environment, they needed to take care of the people who relied on that forest." Calawis is 1 of the 9 barangays that is part of the Upper Marikina Watershed. The UMW is considered an important range because any rainfall that finds itself in the area will find its way through the Marikina River. Remember Typhoon Ondoy? When the Super Typhoon hit the Philippines, environmentalists were able to analyze and conclude that the rain that caused the heavy flooding in Metro Manila came from the UMW because the forest that covered the region was already denuded. The type of livelihood that the upland communities worked on already contributed to this problem, as they got used to consumptive practices. Some examples of these would be making charcoal, chopping down trees, burning crops, and planting produce again. These are the sources of livelihood for the locals, which are deemed to be counter-productive to the measures to reforest the area. For the Malvar’s, they realized that in order to take care of the environment, they needed to take care of the people who relied on that forest. That’s why they put up a nature camp. Since then, they’ve been able to employ some of the locals from Barangay Calawis, and from the surrounding community. 1. There should be a program wherein you can delve into environmental/forest protection or nature conservation. Given that, MPNR continue to plant native trees inside the camp site. They also encourage their guests to plant trees during their stay in the resort. 2. A sustainable ecolodge should show efforts to conserve water and energy. This can be done by taking shorter showers, and by turning off the water and the lights when not in use – all of which, are continuously being practiced in the resort. Moreover, MPNR plans to shift into using more renewable sources of energy like solar for example. 3. Waste Management is crucial to the environment, which is what the resort wants to improve on. They’re already constructing their Materials Recovery Facility (MRF); and they have already commissioned some of the local carpenters to create waste baskets for the resort. In this way, the recyclables can be separated from the residuals and the organic waste. These baskets, which will be used to practice proper segragation, will be placed in several areas of the resort, including the rooms and bathrooms. Their target is to have a “zero-waste to landfill” surrounding, which means 99% of generated waste will no longer be thrown to the landfill. So the garbage will either be reused, recycled or composted. 4. A local community participation or programs should be created. So in order for them to be the caretakers of the forest and the mountain, they should also be the caretakers of the people. If the locals who rely on the forest for their livelihood are neglected, then reforestation would be for nothing. That’s when they created an organization called the “Bayanihan sa Kabuhayan”. Now, aside from providing alternative forms of livelihood for the locals, they’re also offering a scholarship and health program (amongst other initiatives). One of the highlights of my stay in the resort was our interaction with the Dumagats – the original inhabitants of Mount Purro. They are the Indigenous People residing in the area of Calawis, who are also known as Rimontados (an IP sub-group). We had the honor of spending time with Datu Sonny, Kuya Rey and Kuya Isok, as they taught us how to start a fire by means of bamboo shreds (also known as Kusot). They also showed us how to cook Sinigang na Baboy and Pandan Rice using only bamboos and wood as our cooking pots. We were completely amazed on how the food turned out using just these natural resources. Although their process was time-consuming, the fruit of their labors tasted nothing like we’ve sampled before. The Sinigang didn’t have the usual broth or soup, and they didn’t even use any Sinigang mix. But they were still able to achieve the sour taste by including a plant that they called “Pilukaw”. The Pilukaw complemented the Sinigang, as every bite of the leaf left a tangy but really good taste! Since we came in as a big group (8 adults and 1 toddler), my friends and I were provided with the Family Forest Getaway Package. We were able to sleep comfortably in the spacious native-looking Loft Cottage, despite not having A/C. The 2-storey house actually had a nice arrangement, as the main windows were open to let in fresh air. We had no means to close the windows though. But at least the entire lodging was fully protected with nets. I also appreciated the fact that our Farm-style accommodation had two bathrooms to share (with one heater), and a jug filled with cold water for us to drink at anytime of the day. The meals at Mount Purro Nature Reserve were always a treat. Every mealtime we were served buffet-style, and each time, different dishes were beautifully served. Not only did the restaurant (also known as Loli’s Kitchen at the Mess Hall) looked tastefully designed and arranged, the food that we ate were also mouthwatering. We always came out of the dining area feeling stuffed but very satisfied. We were able to go around the nature camp, and was able to see the other accommodations and the available facilities (all native-inspired). We saw that MPNR wasn’t only an ideal location for nature-seekers, but was also perfect for organizing events like team teambuildings, private meetings, planning seminars, conferences, corporate events, parties and more. They also have activity areas that any age can enjoy like a Game Room, which has billiards, table tennis, foosball, mahjong, and board games. But if these aren't enough, you can still swim a few laps at the Infinity Pool, go on a 4-kilometer hike to the top of the mountain, or roast some marshmallows with your friends by the Bonfire Areas. You can also end the day with a good massage, as MPNR offers spa treatments. 1. From Aurora Boulevard, take a jeep or shuttle van that's bound for Cogeo (P35 from McDonald’s Gateway, 40-minute travel). 2. From Cogeo, take another jeep going to Paenaan (P23, 50-minute travel). Ask to be dropped off at Kanto Veterans. 3. From Kanto Veterans, ride 2 tricycles to Barangay Calawis (P145 total for both rides, one-way). In 20 minutes, you will reach Mount Purro Nature Reserve. 1. Take Aurora Boulevard / Marcos Highway. 2. Keep going straight. You'll pass by Sta. Lucia East Grand Mall and Masinag Market intersection along the way. 3. You know that you've reached the Cogeo Junction when you finally see a green concrete pedestrian overpass. 4. Follow the road, and enter the ARC that says "UPPER MARIKINA RIVER BASIN PROTECTED LANDSCAPE". 5. Slow down as soon as you pass a bridge. You will have to take a left in the next corner, which is Kanto Veterans. 6. About 4 kilometers from Kanto Veterans, turn left to Marcos S. Garcia Road. 7, Keep going straight! You will soon see a sign that says “BARANGAY CALAWIS”. 8. Keep following the cemented road. 9. In a few minutes, you will see a wooden steel gate on the right and the sign: MOUNT PURRO NATURE RESERVE. 🌿Visit Mount Purro Nature Reserve for only P2,413/person (2D/1N)! 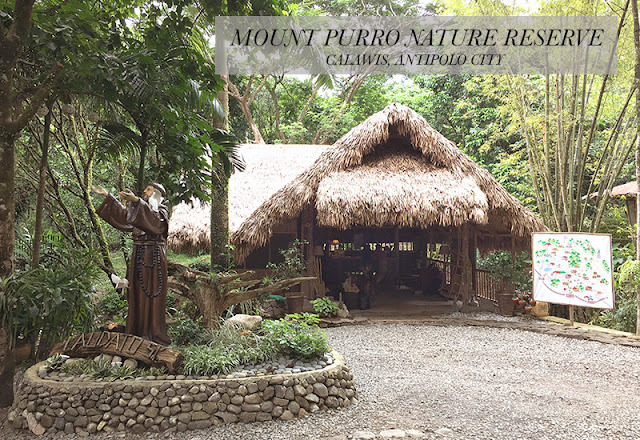 Make Calawis your destination of choice when visiting Rizal because our trip to Mount Purro Nature Reserve definitely gave us a refreshing experience. Not only did we get to commune with nature, we also learned about a family’s initiative to make the world a better place to live in. Note: This is a sponsored stay with Mount Purro Nature Reserve. (Budget Biyahera) I do not represent the thoughts, intentions, plans or strategies of the establishment or its owners. All views and opinions shared on this website are solely my own.